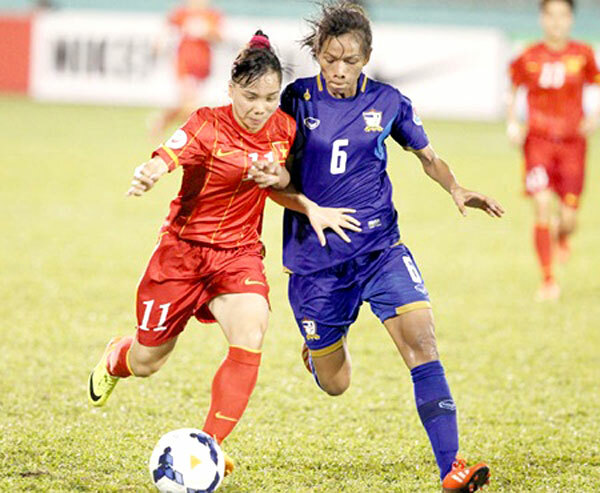 VietNamNet Bridge – Two terrible mistakes from captain Le Thi Thuong and goalkeeper Dang Thi Kieu Trinh handed Thailand a 2-1 victory over the home team Viet Nam in the fifth-place play-off match at the Asian Football Confederation (AFC) Women's Asian Cup last night, May 21. Vietnamese striker Nguyen Thi Nguyet (left) fights for the ball against Thai midfielder Pikul Khueanpet during their AFC Women's Asian Cup play-off yesterday in HCM City. Thailand won 2-1 and bagged a ticket to compete at the Canada World Cup next year. At Thong Nhat Stadium in HCM City, striker Kanjana Sung-Ngoen was Thailand's heroine, scoring both goals for her team in the second half to help Thailand repeat their victory over Viet Nam in the final at the Southeast Asian Games last December in Myanmar. Nguyen Thi Tuyet Dung was the scorer for a below-par Viet Nam in the 85th minute with a powerful shot that hit the underside of the crossbar before rattling the net. The victory not only gives the Thais a fifth finish for the first time at the continent's biggest women's football competition, but also hands them a place at the FIFA Women's World Cup next year in Canada. Viet Nam's head coach, Chen Yun Fa, was not pleased with his players, and said they had failed to show what they did in previous games, especially in defence. "We did not play well in the first half because the players were under huge pressure and could not deploy their usual game. The defenders were in bad form today and three of them failed to prevent Sung-Ngoen's first goal," Chen said. The Chinese man also congratulated Thailand for securing the World Cup berth. The significance and importance of the match obviously had an influence on the two teams, especially the Vietnamese side, as the match got off to a slow and disjointed start. Both teams took a cautious approach to the match in the opening minutes, prioritising safety at the back rather than being adventurous up front which resulted in a lacklustre, tedious first half devoid of goal-scoring chances. The 18,000 home fans and dozens of travelling supporters did not have an occasion to cheer for most of the half, and the sounds coming from the stands were groans of disappointment at misplaced passes and successful clearances. Viet Nam made a positive start to the second half while the Thais tried to catch the home side on the counter-attack, taking advantage of their youthful strikers. But the breakthrough did not come from a well-worked play from Thailand but from a mistake from captain Thuong. The veteran lost the ball to Sung-Ngoen near the halfway line just two minutes into the second period, and the Thai striker was able to muscle past three defenders before beating keeper Trinh with an angled shot. Viet Nam responded in search of the equalizer, but were unable to make any of their possession count, and Sung-Ngoen silenced the home fans from a seemingly-impossible to add a second following Trinh's mistake. Sung-Ngoen burst down the right flank and crossed the ball into the box, deceiving Trinh who had come too far off her line. Although Trinh was able to dive back and palm the ball out of the net, the referees assistant judged the ball had already crossed the goal-line to Sung-Ngoen's stunned reaction. Viet Nam brought on young players Dung, Vu Thi Nhung and Nguyen Thi Nguyet who sparked life into the match as Viet Nam put Thailand's goal under siege. The home team's relentless efforts were finally rewarded with a goal from Dung with five minutes remaining. The goal stooped the flow of fans already leaving the stadium and provided a glimpse of hope as Viet Nam pushed forward with even greater determination to find the equaliser, but the final chance was a narrowly-missed shot from Nhung.